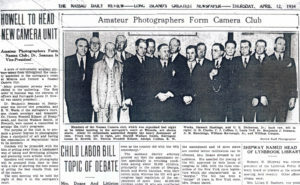 Founded in 1934, The Nassau County Camera Club (NCCC) is devoted to enhancing members enjoyment and knowledge of photography. 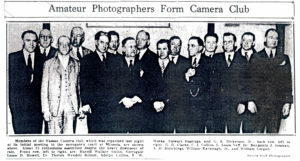 The original founders of the club can be seen in an April 12, 1934 newspaper article below. Membership in the club is open to all film and digital photographers over the age of 17. Meetings are generally held on the first Monday and third and fourth Wednesdays of each month at the Levittown Library, 1 Bluegrass Lane, Levittown, NY 11756 . See the calendar for details. Click "Directions" at the top of this page for map and driving directions. Do you love to take photographs? Here's a chance to enhance your technical and creative skills through seminars, workshops, competitions, exhibitions, and more. Join us--we're a friendly group of men and women of all ages who love photography. A membership application can be found here. Learn by doing photography at our hands on workshops. Enhance your knowledge through lectures, seminars and workshops. Share your photos through competitions, critiques, exhibitions, and digital slide shows.